Several people have asked how the weather has affected our plants this year, with the snow in March and the heat wave since May, and one of the results has been some unusual flowering times. 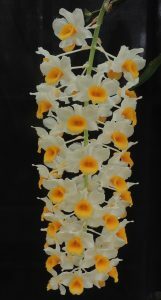 Dendrobium thyrsiflorum usually flowers in April at Writhlington and did so again this year but with fewer flowers than usual. One possible reason was the prolonged dark days during the snows and cold weather as our thermal screening stays across when outside temperatures are below freezing. This week the same plants are in flower again (several different clones) and the greenhouse is again dominated by their dramatic pendulous flower spikes. This majestic species is native to Eastern Himalayas and South East Asia. 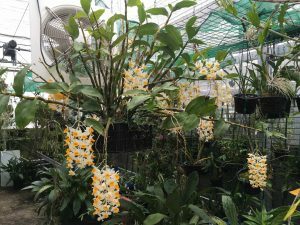 We have seen it on school expeditions to Laos growing in the tops of tall trees in evergreen and semi deciduous forest at around 1000m where it experiences warm wet summers and a dryer cooler winter. To reflect the natural habitat we grow the species in Warm Asia during the summer but move it to cool Americas for the winter. We are delighted to have a lot of seed germinated from a cross between the two clones shown and this will be ready for sale in about eighteen months. Do you think this poor confused plant and his friends have been harmed by the weather/ lack of daylight and by flowering twice or are you just lucky to have beautiful flowers twice in one year? Is it because they are distressed and are trying to produce more seed for future plants? 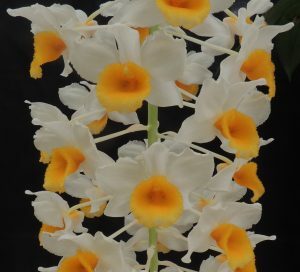 I have read that some people put their Dendrobiums in the fridge to get them to flower but I think you would need a very big fridge to fit your plant in as it is a magnificent specimen.